They say there are the women you, er, "date," and the women you marry. Neutral or not, these are no bride nails. 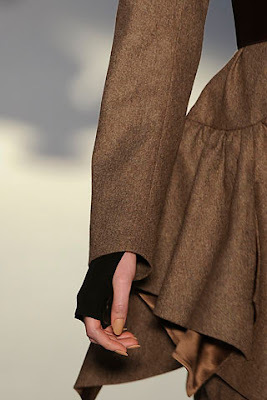 YSL's Stefano Pilati has stripped out the dark from the pointy, Newton/Dietrich-esque manicure he favored for spring, but kept it just as sinister for fall with this carcinogenic-looking tan. You're not going to appeal to the masses with claws like these, but maybe you'd attact the kind of man who'd bring you a king protea. Rarrgh! Two words, HH - Jungle Red! Haha! My toes are Jungle Red right now. My mom never wore anything else. My sister once kicked her shoes off in front of a banker type to reveal her dark burgandy vamp polish. "Trrrryyyy pink, honay, try piiiiink." Neither of us has worn pink since. I'm partial to Chinatown myself but I did just pick up a bottle of M Butterfly for a possible change up. I'll let you know how it goes.